This new volume from editors Murray Pomerance and R. Barton Palmer sets out to challenge reductive views of the career of John Frankenheimer. Discussion ranges from prominent early works to relative obscurities, such as the Joseph Losey-inspired foray into art cinema, The Impossible Object (aka Story of a Love Story, France, Italy 1973), or the adaptation of Bernard Malamud’s tale of turn-of-the-century pogroms and persecution, The Fixer (UK 1968). The picture of the director that emerges here is necessarily incomplete, and complicates, rather than clarifies Frankenheimer’s standing in film history. 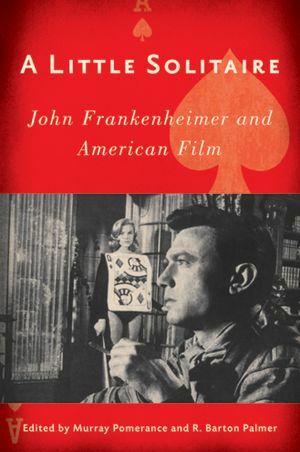 Unsurprisingly, Frankenheimer’s films of the 1960s loom large, taking up around half of the book, despite already being the subject of the overwhelming majority of Frankenheimer scholarship to date. David Steritt looks at the suffocating atmosphere of tension in Frankenheimer’s so-called paranoia trilogy, comprising The Manchurian Candidate (USA 1962), Seven Days in May (USA 1964), and Seconds (USA 1966), although he veers into dangerous territory by psychoanalysing the director through these films, diagnosing the “clipped and constipated” Seven Days as a symptom of “a cinematic superego… warily policing itself lest its scary and plausible plot displease audiences.” (19) Charles Ramírez Berg fares better, accounting for the canonical standing of The Manchurian Candidate through a neo-formalist reading of how its cinematic style evokes the denial of self-determination and the sensation of “compromised agency and uncertain causality” (p.46) through a divergence from generic forms and the withholding of exposition. Tom Conley sees shades of Robert Bresson’s A Man Escaped (France 1956), and Michel Foucault’s Discipline and Punish (France 1975) in The Birdman of Alcatraz (USA 1962), while Matthew H. Bernstein looks at Frankenheimer’s interweaving of fictional and historical elements into the generic structure of The Train (USA, France, Italy 1964). Victoria Duckett likewise bases her analysis of Grand Prix (USA 1966) in historical fact, but largely overlooks the immediate industrial context of the film in favour of a strained free-association that draws parallels between the French Grand Prix de Rome and the American Academy of Motion Picture Arts and Sciences – a link which she herself unwinds by the end of her essay. The best essays in this book glean newfound contemporary resonance from Frankenheimer’s films. Corey K. Creekmur weaves a complex web suggesting how Frankenheimer’s oeuvre anticipated America’s 21st Century “War on Terror” – not just the obvious example of Black Sunday (USA 1977), a film lambasted for its ludicrousness upon initial release, only to be played out in real life almost a quarter of a century later, but also through a prophetic acknowledgement of the links between the contemporary “style of terrorism,” (106) and the alienating powers of modern mass media in the Red Brigades drama Year of the Gun (USA 1991). Creekmur arrives at an aesthetic of visual engagement with technological depiction, developed as early as Frankenheimer’s television work of the 1950s, where his use of screens within screens foreshadows a common visual trope of the post-9/11 action film. Christina Cornea does similarly bravura work, recontextualising the science-fiction/horror triptych Seconds, Prophecy (USA 1979), and The Island of Dr. Moreau (USA 1996) as an allegory of the violation of the body amidst the consolidation of white male patriarchal power within the body corporate. Elsewhere, A Little Solitaire does some digging in the hope of rehabilitating forgotten works: Linda Ruth Williams considers the ambivalent sexual politics at play in the depiction of Tuesday Weld’s fille fatale in I Walk the Line (USA 1970), while Jerry Mosher provides a welcome dissection of the failed vanity-project The Impossible Object. James Morrison re-evaluates Frankenheimer’s epic American Film Theatre adaptation of Eugene O’Neill’s The Iceman Cometh (USA 1973) within the context of the New Hollywood, as cinematic space fragments into self-contained “visual essays on immobility” (p.176), plumbing yet deeper depths of despair than O’Neill’s already crushing play. Dennis Bingham, in his fascinating discussion of the little-seen The Gypsy Moths (USA 1969), identifies Frankenheimer as a “transitional figure” (p.214) uncomfortably straddling the divide between Old and New Hollywoods, which goes some way to accounting for Frankenheimer’s lack of visibility on the current critical scene. One of the shortcomings of this book is the lack of discussion of Frankenheimer’s contemporaries: figures like Robert Aldrich, Sidney Lumet, Stanley Kramer, and Don Siegel are conspicuously absent here. Also sorely lacking is a detailed attempt at defining the unifying characteristics of Frankenheimer’s visual style. Multiple essays identify his signature “big head” shot (33-34), wherein one character dominates the extreme foreground of a deep-focus shot, while other characters occupy multiple planes of action in the background. Few contributors move beyond this singular observation. Berg diligently indicates that Frankenheimer developed his trademark use of wide-angle lens in his television days to “enhance… production value… by making small studio sets appear bigger on… home screens” (32), but observations of this kind are few and far between. Stephen Prince identifies a pseudo-documentary aesthetic at work in Ronin (UK, USA 1998), but prefers to focus on the interplay between suggestion and abstraction in Frankenheimer’s superficially straightforward filming of David Mamet’s austere screenplay. Palmer and Pomerance note a fondness for documentary-style procedural sequences, which Duckett also perceives in Grand Prix, but in both cases these claims go undeveloped. A more comprehensive analysis of Frankenheimer’s adoption of documentary techniques, combined with his distinctive use of montage and wide-angle lens, is essential to understanding his mechanics of cinematic suspense. A further criticism is that the contributors avert their collective gaze from some of Frankenheimer’s more uneven works: key works of the mid-1970s, namely the flawed but nonetheless notable gangster picture 99 and 44/100% Dead (USA 1974), and the unrelentingly bleak French Connection II (USA 1974) garner nary a mention. More glaringly, none of his films of the 1980s are scrutinised. A consideration of the ways in which Frankenheimer brought his idiosyncratic visual style to bear upon such straightforwardly generic fare would have been a worthwhile addition to the book. These omissions result in a somewhat idealised revision of Frankenheimer’s output, as obscure oddities are privileged over the often anonymous thrillers by which Frankenheimer made his mid-career bread and butter. This book identifies a series of thematic and generic cycles at work in Frankenheimer’s films. A fittingly multifaceted account of a diverse directorial career, A Little Solitaire makes its case for reappraisal of Frankenheimer’s films, offering numerous points of engagement that will hopefully open into a continuing dialogue on his oft-overlooked contributions to the American cinema.